The Visionary Activist Show – [updated] Standing Rock Persisting Everywhere! 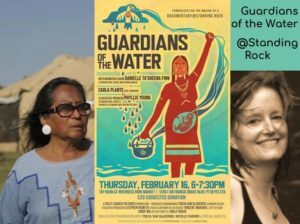 making “Guardians of the Water,” a film to debut at the Standing Rock Film Festival… Composting Colonialism into nutrient for Sane Reverence. And weaving in Mitchell Zephier, Executive Director of the Standing Rock Nation Film Festival. And it’s Fund Drive time – – proffering 100 all access passes to the Inaugural Standing Rock Nation Film Festival being held at Prairie Knights Casino & Resort, Fort Yates, May 5, 6 and 7th, 2017. Phyllis Young (Standing Rock Sioux) is a former councilwoman for the Standing Rock Sioux Tribe and Central Oceti Sakowin camp organizer, coordinator of the First International Indian Treaty Council at Standing Rock (1974), coordinator of United Nations Conference on Indian People and theirs Lands (Geneva 1977 – beginning UN Declaration on the Rights of Indigenous Peoples), Co-Founder of Women of All Red Nations (1978 – worked to end the forced sterilization of Indian women and support the welfare of children), former Chair of Board of Trustees of National Museum of the American Indian and 15 years Board Member.